Wesley learned to live with his ventral hernia for 25 years, but after undergoing a hernia repair with AccessOC and Mission Hospital, he can now focus on regaining strength and happiness. AccessOC and Mission Hospital are honored to have received the Giving is Living Award at the Spirit of Volunteerism Awards 2017! Rosa has been our faithful volunteer. She learned she needed a cholecystectomy, the removal of the gallbladder. AccessOC arranged for her to attend our Kaiser Surgery day. Rosa thanked everyone at Kaiser and let them know they make a big difference in people’s lives. Rosa also said she will continue to volunteer with AccessOC as a way to give back! We are do proud of our former volunteer Daisy.! She is working hard to pursue her education and currently attending UCLA School of Nursing. 12% of Orange County residents are medically uninsured. That is almost 379,825 people with no medical coverage. Many of them are low-income working individuals at 200% or below the federal poverty level who cannot afford to pay for essential medical care. Medical complications can put them out of work or turn them homeless. AccessOC works with local hospitals, doctors, nurses, translators and other community volunteers to deliver free high quality speciality medical services to low-income uninsured individuals who need care. AccessOC's mission is to improve the health of the underserved by coordinating and providing access to high quality specialty care. Since May 2007, we have been mobilizing medical volunteers to provide free low-risk surgeries to low-income uninsured patients. Four hospitals participate in the program including: Kaiser Permanente, Mission Hospital, St. Joseph Hospital of Orange, and St. Jude Medical Center. AccessOC would be nothing without the help, service and donations it receives from the Orange County community. We are able to make incredible impact on people's lives only because of the generosity of our many volunteers. We depend on volunteer doctors, nurses, technicians, schedulers, interpreters, and community members to successfully provide free surgeries to the uninsured. We also appreciate the support of local photographers to help capture our patient and volunteer stories. Our urgent need right now is for medical volunteers, especially surgeons. If you don't have the opportunity to volunteer for us, you can immediately show your support by giving a donation to AccessOC, making an instant impact on our program and the services we offer. Even a small donation from you can go a very long way in helping us, our medical experts, volunteers and surgeons perform at their best with the highest quality staff and resources available. Make a difference in your community today for those who may be less fortunate. An inside look at community stories, news and events coverage that we have going on at AccessOC. Save The Date! Kaiser Surgery Day- Coming Soon! Donald worked with AccessOC as an AmeriCorp fellow for one year. 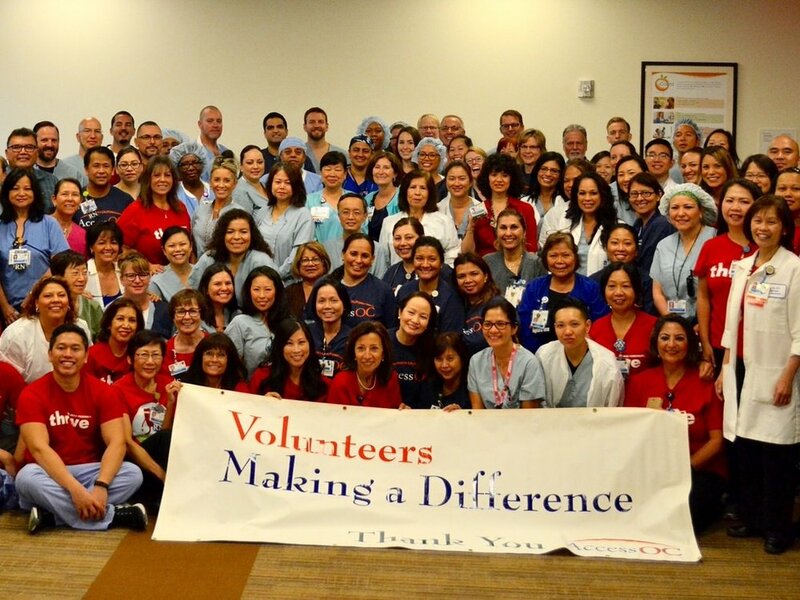 He has continued to volunteer with us while attending UC Irvine School of Medicine.